A Cancer Survivor to Her Breasts: Where Are You? Did Chemo Cause a Late-Night Trip to the ER? July 21, 2016 – Susan F.
Alternative methods of fighting cancer may be found in natural supplements. Bonnie Annis is a breast cancer survivor, diagnosed in 2014 with stage 2b invasive ductal carcinoma with metastasis to the lymph nodes. She is an avid photographer, freelance writer/blogger, wife, mother and grandmother. For the past two years, I’ve been on a quest to find the best alternative methods of fighting breast cancer. I’ve done a lot of research and have found many things to add to my daily regimen. I never thought I’d find one of the most important items in my spice cabinet, but I did! The spice I’m speaking of, turmeric, isn’t well-known in most American homes and is more popular in Middle Eastern countries. As with the addition of any supplement, I would encourage you to talk with your medical professional. Everyone is different, and what works for one person may not necessarily work for another. What is turmeric? Turmeric is a perennial plant native to Southeast Asia, China and India. The plant has large, oblong leaves and yellow funnel-shaped flowers. Underneath the plant, a thick yellowish orange rhizome is present. When the rhizome is dried and crushed into a powder, the beautiful golden spice, turmeric, is harvested. This coveted spice is used by cooks all over the world to add a warm flavor and color to foods. Turmeric has also been used for centuries in Ayurvedic and Chinese medicines to treat inflammation and cure infections. Curcumin is the yellow pigment extracted from turmeric. 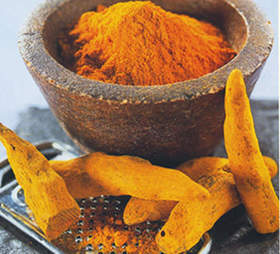 It is one of three known curcuminoids present in turmeric. Curcumin has demonstrated incredible anticancer benefits. In countries where people eat turmeric daily, research has shown that there are lower rates of certain types of cancer. Ingesting levels of about 100 to 200 mg a day over long periods of time seem to work best in most cases. Curcumin has been extensively researched for many years and although promising results have been obtained from laboratory trials, it is still not seen as a widely prescribed cancer therapy. Drug companies don’t patent natural substances and with no potential for profits, they have good reason not to do so. Even though curcumin and the benefits aren’t widely known, there are very important reasons to consider using the spice turmeric. It can be used in cooking various recipes or ingested by taking supplements in capsule form. I happen to enjoy doing both. The best and easiest way to incorporate turmeric into your healthy healing regimen is to begin adding it to foods you cook. Turmeric powder can be added to many foods. The light flavor is complimentary to eggs, soups, sauces, vegetables, chicken and rice. The possibilities are endless with this flavorful spice so use it on whatever you like. (Note: turmeric does have a very deep rich color and can stain hands, clothing or countertops, so be careful while using it). I’m a firm believer everything we need to stay healthy and fight disease has been given to us by God in nature. Plants, spices, herbs, essential oils and even foods may be beneficial to our natural cancer-fighting regimen. For me, the addition of turmeric to my daily diet has been wonderful. For the past couple of years, I’ve been adding it to just about everything I cook. I’ve also been taking a turmeric capsule containing 400 mg twice daily. To date, I remain NED (no evidence of disease). I hope you’ll consider talking to your doctor about adding turmeric to your diet and enjoy the benefits of its natural healing properties. I’ve added this, along with many other vitamins and supplements, to my daily arsenal of cancer-fighting weapons. If you’d like to read more about those, I’ve written another article for CURE and you can find it here.